Was there any reason to expect a good Sunday? And when the sabbath was past, Mary Magdalene, and Mary the mother of James, and Salome, bought spices, so that they might go and anoint him. And very early on the first day of the week they went to the tomb when the sun had risen. And they were saying to one another, "Who will roll away the stone for us from the door of the tomb?" (Mark 16:1-3 RSV). The women were faced with the sad and depressing task of preparing the body of Jesus for permanent burial. Because the Sabbath laws were strict, they had time only for the barest necessities of burial on Friday afternoon. And even that had cost them. They were ceremonially unclean and had to miss much of the holy celebrations taking place at the time of Passover. Now the problem they faced was how they would be able to roll away the great stone which sealed his tomb. Isn't that really something? All about them the very Heaven of Heavens was bursting with jubilation, yet they could only see the common and mundane. They never see the power of the One True God. Friday, the sun had darkened, earthquakes terrified Jerusalem, and the veil of the Temple which separated the Holy place from the Holy of Holies had been ripped in two by unseen hands. The dead rose from their tombs and walked the streets. 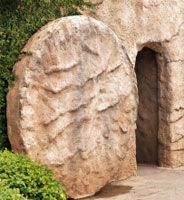 Yet this morning, the women who knew Jesus best just wondered, in their grief, about a rock over the door of the tomb. And then, the mystery of the ages began to be revealed to these humble women. Jesus is not dead! Even then, neither they nor the men who had followed Jesus could possibly grasp the power of that statement. The work of God, planned from before the foundation of the world had come to pass! Almost 2,000 years later, mankind is not much different. While "The heavens are telling the glory of God; and the firmament proclaims his handiwork" (Psalm 19:1), mankind is still concerned about who will move the stone! The women never dreamed of the resurrection. They certainly would not have expected angels to remove the stone. In spite of the years they spent hearing Jesus' words and seeing his miracles, they looked for no help from the God of the universe. Today, people still live in the presence of the mighty hand of God and wonder. They do not wonder about heavenly glory or chariots of fire. They never see, through faith's clear eye, the power of the One True God. They simply walk in doubt and are concerned about the simplest of earthly things, deaf to the thunder of His might and blind to the brilliance of His Glory. The women fretted about who would roll away the stone to open the tomb and let them in to show their faithful love to Jesus, but they never dared to dream that God would open the tomb to let us all out. But, that is what God did! There You Will See Him! "Who Will Roll Away the Stone" by Bill Sherrill is licensed under a Creative Commons License. Heartlight encourages you to share this material with others in church bulletins, personal emails, and other non-commercial uses. Please see our Usage Guidelines for more information.